The late Stephen Covey, author of “7 Habits of Highly Successful People,” wrote one last book, “The 3rd Alternative” before he died. In the book Covey makes the case that when faced with virtually any dilemma we can usually find a 3rd path. The 3rd path is usually preferred by all parties involved. For example, suppose I want to eat Chinese food and my wife wants to eat French. In Covey’s model neither one of us has to lose if we can find an avant guarde restaurant that does dishes that are a mix of the best of Chinese and French cuisine. 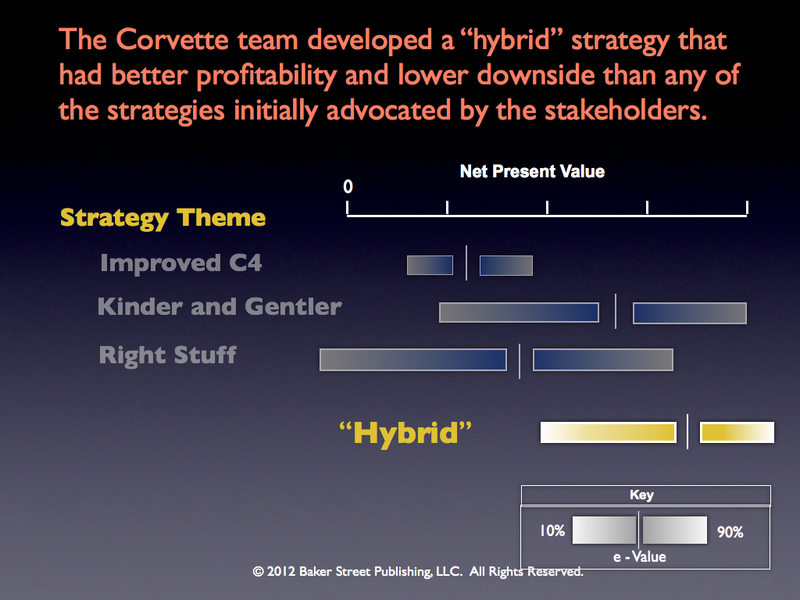 In strategic decision making, the “3rd alternative” is called the Hybrid. 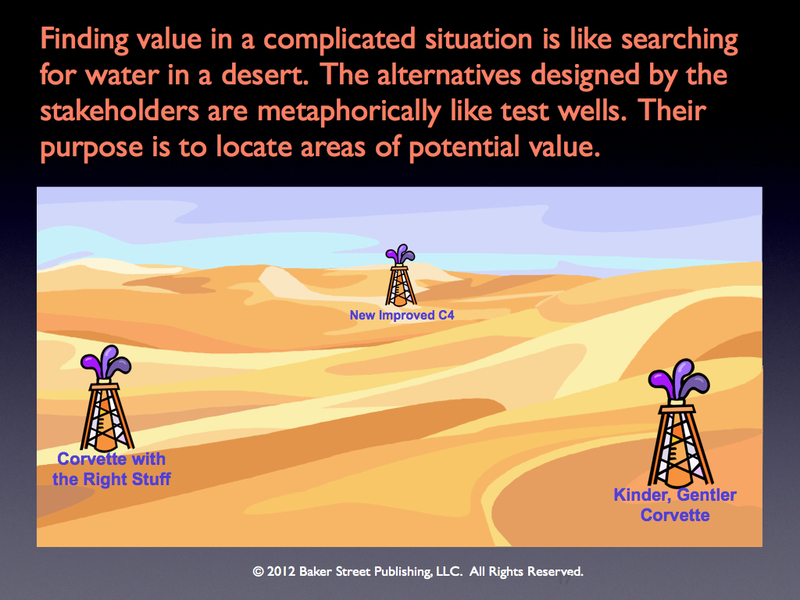 In decision coaching our goal is to help a team find a solid, innovative strategy. We seek a strategy that will incorporate the best parts of all the alternatives we might seriously consider implementing. In other words, a hybrid. Steve Jobs found a hybrid strategy as he built the new Apple. Today Apple is the best parts of a software company and the best parts of a hardware company. The glue that holds it together is the operating system. How do we find these hybrid solutions? The Collaborative Design process has evolved over the last 40 years as a way of finding the Hybrid. The process starts with framing the problem and laying out the alternatives. See the figure at left. If this is done well there is usually a good creative tension between the alternatives, e.g., do we go for high performance or do we go for low cost? To resolve the tension, we gather information and analyse the alternatives. By doing this we usually learn what is important and what is “good” about each option and what is “bad” about each. My experience in scores of strategic decision projects is that we can usually construct a “Hybrid” strategy that significantly outshines anything we were originally considering. The hybrid emerges from a collision of analysis and sythesis. It is a design process. We “connect the dots” and design something that is better than anything we could have imagined. 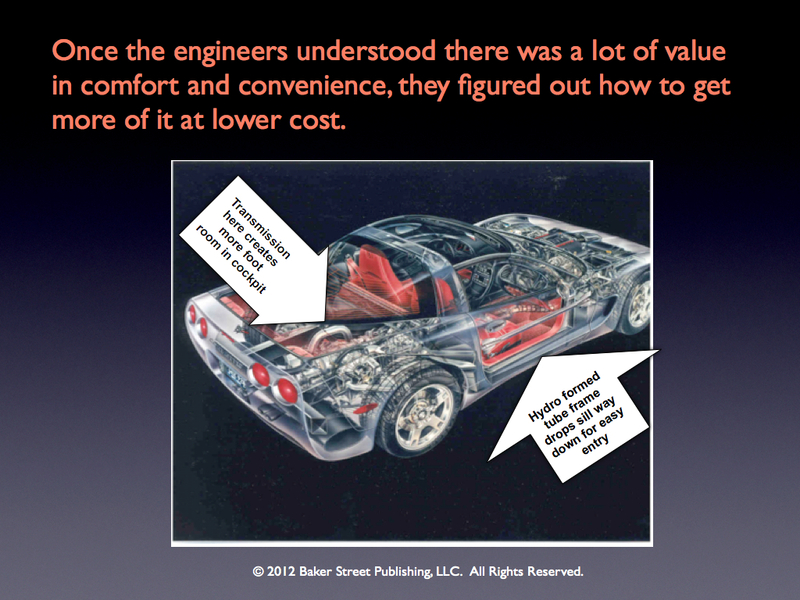 The market researchers and systems engineers on the team had a very different vision. They believed a “kinder, gentler” car might be more in line with customer needs. A Corvette that was easier to get in an out of, one with more room in the cockpit, and a trunk big enough for two golf bags. A third group, driven by financial concerns, wanted the team to consider a minimalist option, i.e., a face lift and some quality improvements. 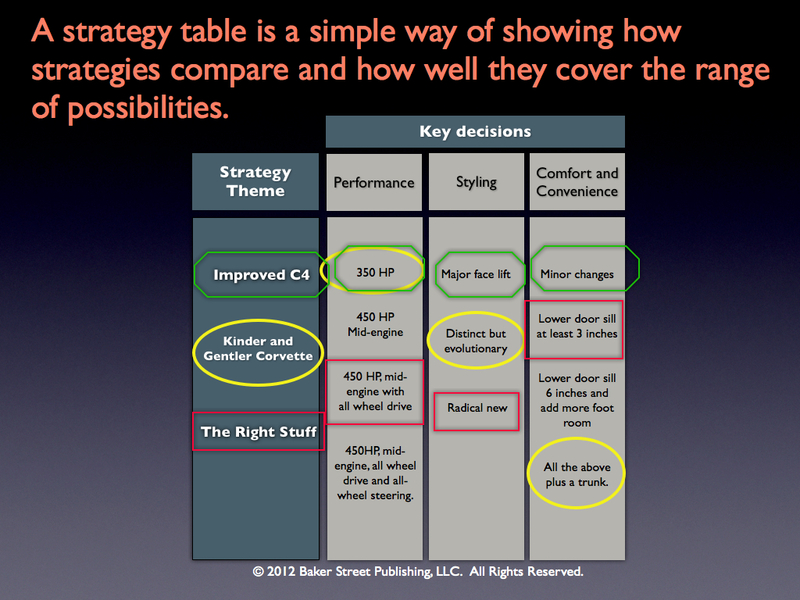 The three options are laid out in the strategy table on the left. In the analysis phase the team learned that the “Kinder, gentler” had the best overall prospects. Once the engineers learned the bottom line value of improving “comfort and convenience” they quickly figured out how to get much more for less money —- a hybrid. The transmission was moved to the rear (a transaxle configuration) to allow more foot room AND better weight distribution. A new hydroforming technology was used to drop the door sill so the car was easier to get in an out of AND lower costs. And, a trunk was added, just big enough for two golf bags. See the figure on the right. The car was comfortable — fast — and fun to drive. The car was a winner. Car and Driver magazine said the car was “virtually perfect.” The Society of Automobile Engineers declared it the “best engineered” car of the 20th Century. GM could not make enough Corvettes to meet demand. The basic design concept is still going strong. The Organizational Development staff at General Motors studied different strategic decision processes in the mid-1990’s. 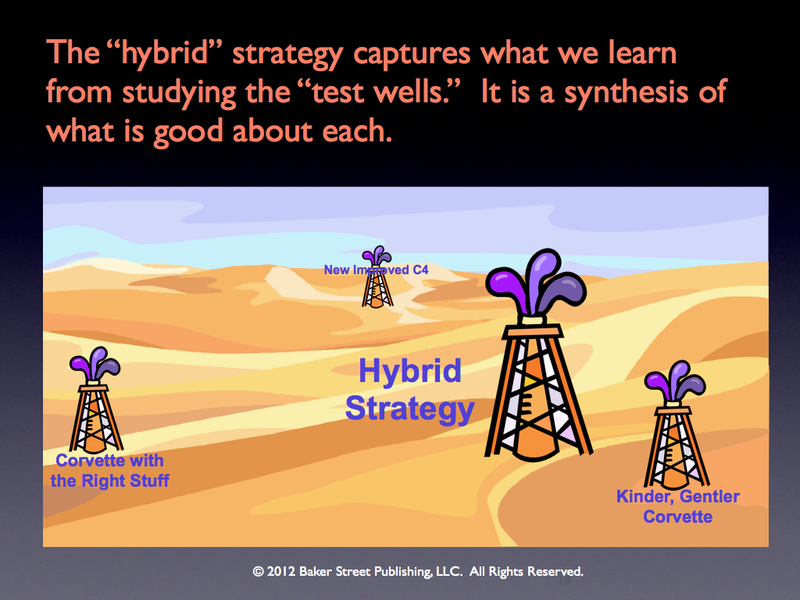 In one study they estimated that the “hybrid” strategies delivered by the Collaborative Design Process were 30 to 200 times more profitable than the best “test well” strategy. 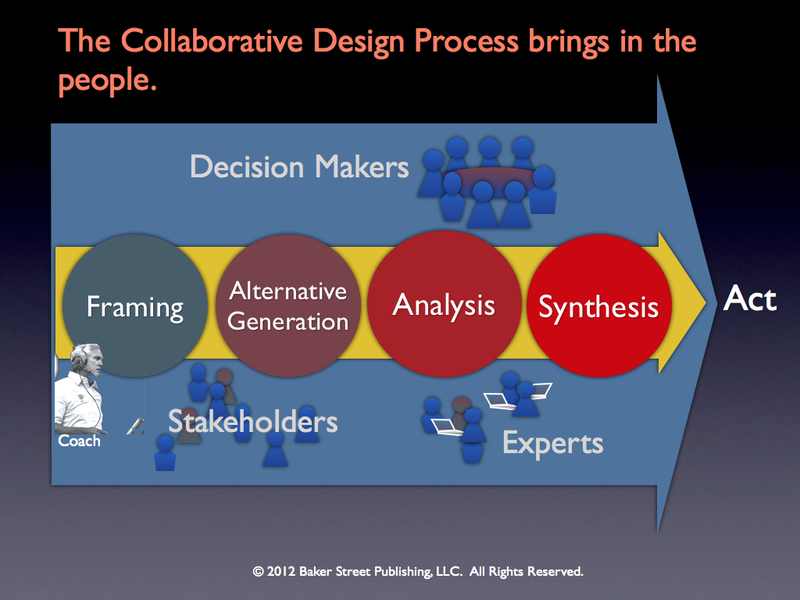 The slides used in this blog are from the Coach’s Guide to the Collaborative Design Process. The slides can be viewed on Slideshare. The mission of Baker Street is to provide decision coaches with the things they need to be successful.